A bathroom remodel doesn’t always have to be an enormous project. 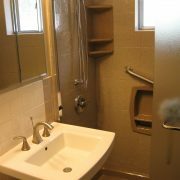 You may find you love your bathroom but for a few dated features, if that is true call The Remodeling Pro today. For over 36 years we’ve been helping clients just like you develop a small or partial bathroom remodel that doesn’t break the bank, but will transform your bathroom into a modern oasis. Adding new lighting, a fresh coat of paint or a new cabinet counter top can make all the difference. The Remodeling Pro can design and build a new bath you can be proud of; all you need do is set the budget and time frame for completion. The Remodeling Pro’s highly-trained project managers are ready to guide you into a new bathroom remodeling adventure, starting with a FREE no-hassle consultative appointment. Call today for an appointment (816) 286-9800. What is a partial bathroom renovation? It is exactly what it sounds like, a facelift with limited real construction. The Remodeling Pro can replace and upgrade your bathroom simply with new lighting, cabinets, flooring or accessories. If you like the general layout of their bathroom, there is no need to for major changes in your bathroom structure or plumbing. Finally partial bathroom remodeling can be far less expensive than a complete bathroom remodel. The Remodeling Pro Your Ideas Into Reality Makes Dreams Come True Can Help You Age In Place Offers Easy Financing Is #Trending Now! The Remodeling Pro will work closely with you to create your dream bathroom. We can share the latest techniques, building trends and hot bathroom accessories. Most importantly we promise to listen. Listen to your wants and needs during the design stage. We will listen to your concerns during the construction stage. And we will clearly define expectations and costs throughout the process. We think the best way to set ourselves apart from the competition isn’t always best accomplished by offering a cheaper price than the competition. In fact, we know that craftsmanship, quality products and attention to details are the key to our success in the Kansas City metro. Don’t just tolerate your dated bathroom any longer; The Remodeling Pro design and construct a partial bathroom makeover that makes sense for you. Call today us (816)268-9800 or contact us online to start the remodeling project today! Remember we will keep you fully informed about our progress; respect your home by cleaning up every night during the renovation and finish on your project on time and on budget.